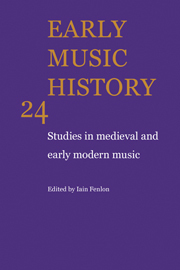 Early Music History is devoted to the study of music from the early Middle Ages to the end of the seventeenth century. It gives preference to studies pursuing interdisciplinary approaches and to those developing new methodological ideas. The scope is broad and includes manuscript studies, textual criticism, iconography, studies of the relationship between words and music, and the relationship between music and society. The journal's aim is to bring together the best British, European and North American scholarship.